Formula Won is an amazing pre-workout at less than half the cost of a cup of coffee. Formula Won is an elite pre-workout that focuses on mental and physical aspects of training. Ingredients were carefully selected to provide optimal results based on scientific studies, research and development, and field trials. A large dose of 6g of Citrulline Malate, and Norvaline, provides skin tearing pumps. A full dose of 3.2g Beta Alanine delivers endurance with delayed muscle fatigue, increased power output, and faster recovery from long workouts. The stimulant blend ensures maximum productivity for most grueling workouts. Many pre-workouts over stimulate and result in an unproductive workout. Formula Won brings you pronounced mental clarity and improved mind-muscle connection, lifting the fog so you are focused and performing. What is different about Enzo Products? Quality, quantity and transparency is our mantra. Countless scientific studies highlight the benefits gained from supplementation, however, most retail manufacturers add only enough of these amazing ingredients to "check the box". They hide real doses behind ‘proprietary blends’ stealing your money and limiting your gains. With Enzo’s performance supplements, what’s on the label is what’s in the product and at the dosage studies claim to provide benefits. 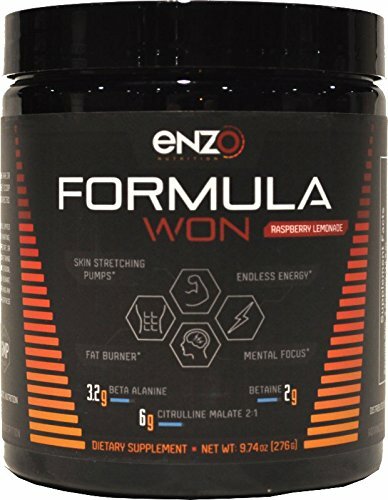 If you have any questions about this product by Enzo Nutrition, contact us by completing and submitting the form below. If you are looking for a specif part number, please include it with your message.